The best guarantee in the industry. Have no fear! Your order is covered by our Arrive Alive Guarantee! We guarantee our trees and shrubs to arrive in healthy condition or we will give you a credit for 100% of the value of your affected plant. However, since we’re dealing with living, breathing things, there are some caveats. See below for the details and we’ll try not to bore you. We guarantee our plants to be true to form and arrive to you in healthy, living condition. Due to the nature of buying living trees and shrubs, you are buying a complete living organism that comprises a root system and trunk. This is at the heart of what you are buying, as the root system and trunk will develop into an established part of your landscape. Cosmetic issues are not covered under this warranty. This includes damaged leaves as this is a natural way that trees and shrubs protect themselves when exposed to darkness or heat. This does not affect the health of plant. Simply trim off any yellow or dried leaves and new foliage should start to grow and your plant will flourish. Deciduous trees (trees that go dormant in the winter months) will often times have minimal, or even no branching when young. This is because in the forest these trees are fighting for height as they compete for sunlight. To promote faster growth and higher branching we will frequently prune branches from juvenile trees. Although this will make for a “skinnier” tree now, in one to two seasons the tree will be taller and properly branched out. We have decades of combined nursery experience and have been shipping products for more than 15 years. Not to toot our own horn but it’s rare that a problem occurs. However, in the unfortunate event that your plant arrives in less than healthy condition, we need to be notified via email within 5 (five) days so that we can assess and diagnose the problem so we can try and save the plant. We will also note your order for future reference in the event that a complication arises. A photo of your affected plant is required for any claim. Because plants are a resilient, living organism their health cannot be immediately assessed as they need time to acclimate to their environment. If you fear a problem, you must report it via email within 5 (five) days of receiving your plant. The Tree Center will note your your concern in our system and we will offer a 100% store credit on the purchase price of the affected plant(s) should it perish within 45 (forty-five) days of the initial delivery. Photo submission is necessary for verification. If your plant was received in good health and no notice was emailed or on file within the first 5 (five) days of delivery, The Tree Center will offer a 50% store credit on the purchase price of the affected plant(s). This one time guarantee is not valid after 45 (forty-five) days past the delivery date. Photo submission is again necessary for verification. Please do not plant a “poor or damaged” plant in hopes that you can bring it around and back to health and then contact us weeks later. Email us immediately. Otherwise a plant that could be saved becomes culturally out of our control and responsibility. Please email us at support@thetreecenter or use our contact form to send your notice or claim. 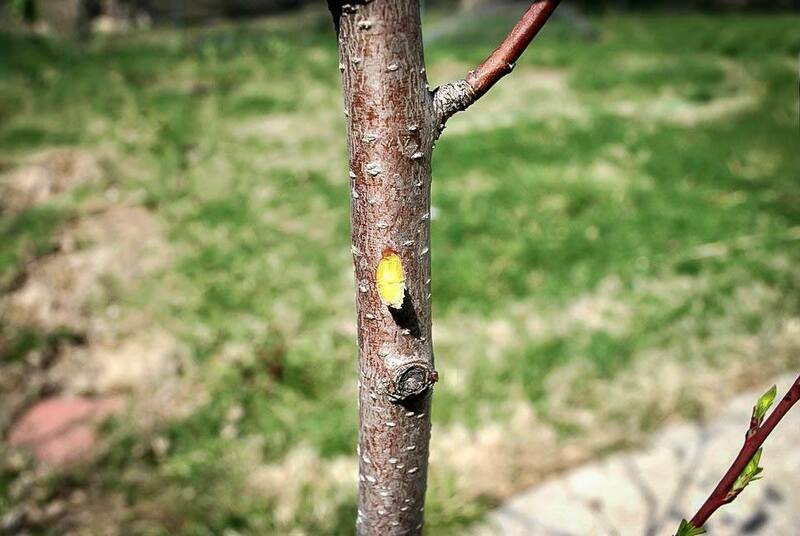 Here’s how you determine whether your plant is dead or alive: scratch a small area of the bark on the trunk of the plant. You can rub it with a coin or if you’re feeling adventurous, your fingernail. If you see brown or black underneath, then unfortunately, the plant is dead. If you see green, then the plant is alive and will leaf out again. If you perform this test during the fall or spring then the plant is likely in full or partial dormancy. If you perform this test during the growing season, then the leaves may have been temporarily dropped as a self pruning measure (a natural protection of plants) during shipping. This is normally temporary and acts a reset switch for the plant. Live plants are not covered under the warranty. Because we’re not selling something simple like shoes, our guarantee only extends to the plant itself. We cannot guarantee your gardening abilities, plants shipped out of recommended zones, human damage, hungry animals, extreme weather damage, overwatering, drought, insects, disease or poor soil conditions. Plants are living organisms that can die from hundreds of different causes that are beyond our control. We’re not a big-box retailer that can offer plants at a loss, or lure you in with unrealistic guarantees in order to upsell you on other merchandise. Trees and shrubs are our only business and we go to great lengths to provide quality products that will make our customers happy and keep them coming back. It is in our best interest to send you a culturally viable plant that will survive and flourish in your environment. Note: Because trees are bulky and we absorb shipping costs on your initial order, we cannot provide return shipping. Replacement plant shipping costs are at the customer’s expense.